Whenever you plan a visit to Delhi, there would be places that would give you the best of food, heritage, shopping and more. But when you stop for a moment and think about the places to actually find peace, the city comes in with the answer that it has a number of gardens and parks for that. 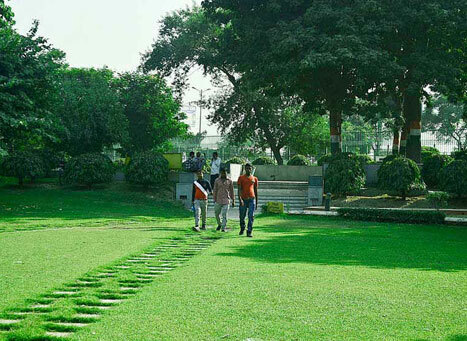 Kalindi Kunj, the green lungs of both South Delhi and Noida, is one of the most loved parks in the city. People who often pass by Kalindi Kunj Road are able to spot the beauty of this park and feel the fresh air making its way to them. Stretching itself over an area of 8.6 acres, Kalindi Kunj Park is the perfect place for walking, jogging, playing sports and sitting around the corner for rejuvenation. Moreover, one of the major reasons for Kalindi Kunj being one of the famous parks in Delhi is that it houses an amusement park as well. Delhi Eye, India’s highest giant wheel is the prized possession of this tourist attraction as it features 3 AC cabins from which one can spot the gems of Delhi like Lotus Temple, Nehru Place, CP and more. The Ferris wheel takes a good 20 minutes for each ride and is inspired by the London Eye and the very famous Singapore Flyer. Along with this, there are rides like Frisbees, Striking cards, Parachute Towers to name a few. It wouldn’t be wrong to say that a day spent at Kalindi Kunj Park with children, friends, and family is worth remembering. Kalindi Kunj Park is easily accessible by Kalindi Kunj metro station which lies some 650m away. The metro station comes under the Magenta Line of Delhi Metro.